Because water always flows to the lowest spot, and sea level is land's lowest spot, Malibu's Santa Monica Mountains Range is graced with a myriad of canyons and ravines, and two of them are in the 84 acres that comprise Bluffs Open Space Preserve. Over hundreds of thousands of years, due to tectonic drift, California's Coastal Range was lifted up to become a mountain range as the floor of the Pacific Ocean moved east and under the North American continent. Then, waves of the Pacific ocean lapped at the west side of the range, causing the bluffs to erode as the land continued to rise and sea level dropped. When it rained, mud, dirt and rocks were caught in the runoff as the rain that fell on the mountains made channels that flowed to the lowest nearby point. Sea level is where water meets land; the canyons end at the beach. Most still carry water when it rains — unless the water has been diverted by people. As a result of the winter rains of 2015-2017 all the streams have water in them! Sometimes a big boulder plugs one route to the sea, but the water is determined. As it builds up behind the boulder, it soon finds a way around the rock, and so it continues downward on its journey to the sea. Never underestimate the power of even a little stream. Creeks carry sand and little rocks and over time these tiny tools of nature chiseled and sanded the land as they sculpted the irregular but graceful ridge lines that frame our city. Banner photo and the Crumbling Sediments shot above are courtesy of the California Native Plant Society. 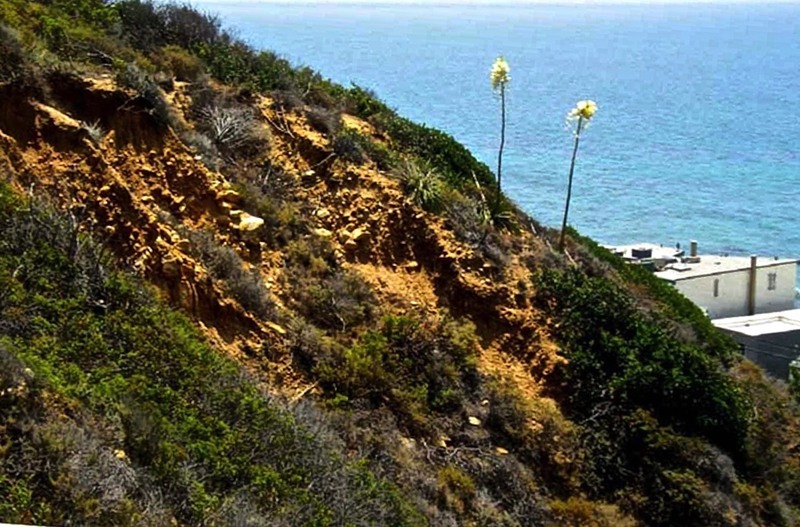 The Pacific Ocean face of Malibu Bluffs bears at least two Yucca plants that were blooming when the photo was taken by California Native Plant Society flora surveyors. Note the crumbling sediments, possibly from an ancient landslide. 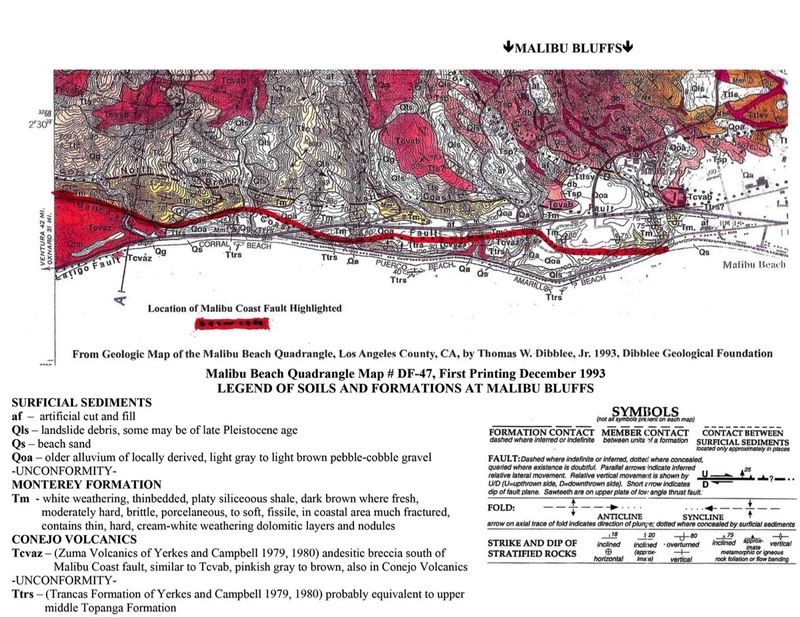 The topographical map below — colored to define geological features in the Bluffs Preserve area — was made available by the California Native Plant Society. As you can see, the Malibu Coast Fault runs through the park.